While American minds were focused on the flagging economy, multiple wars, a ballooning deficit, record unemployment, corporate greed, and economic inequality, the House spent part of Tuesday officially re-affirming 'In God We Trust' as the official national motto of The United States of America. 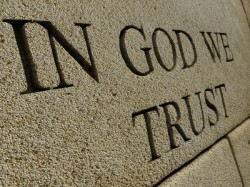 'In God We Trust' has been our official motto since 1956. The phrase has appeared on US coins since 1864, and on paper currency since 1957. Americans see this motto every day when they spend their hard-earned money on overpriced products that are manufactured overseas -- money they earn from jobs that they fear they may lose, if they haven't already lost them. He has a point. How can America possibly overcome its obstacles if there is confusion about the motto that appears in the House chamber above Forbes' head, and in the Capitol Visitors’ Center, and on the very money that he uses to purchase his morning latte? Maybe America is confused. Maybe, despite the motto's inclusion on our currency, its enshrinement in public law and US code, and its appearance on public buildings, we have forgotten that in 2002, President George W. Bush signed into law a bill re-affirming 'In God We Trust' as our official national motto. Maybe, despite the money thing, and the public law and US code stuff, and the re-affirming by Bush, Americans are still confused, forgetting that Senate re-reaffirmed the motto as our official national motto on its 50th anniversary of officialdom. Maybe the House is treating this issue the way many religious people treat prayer requests. Maybe if its repeated enough times by enough people, the signal is stronger, and God is therefore more likely to receive the call if he's traveling through a dead spot in the San Fernando Valley. Maybe now, we can finally get some help on the issues that are plaguing our country. If not from God, perhaps from our lawmakers, who won't need to reaffirm our motto for at least a few more years. What a waste of time and money on this issue! Where are the jobs? Priorities needed to help the American people...duh. The fact that spend time and money on this, rather than actually fixing stuff, is, like Rick Perry's prayer rally, a way of admitting that "look, we politicians, along with the banks and other members of the top 1% have royally screwed *everything* up but, rather than trying to fix it (because that involves, you know, getting off their arses), we invite you to whisper sweet nothings to the man upstairs and get him to sort our mess out - if he doesn't then it must be because you're not praying or condemning the gays enough!"